An international research team, led by Dr. Yuji Harada from Planetary Science institute, China University of Geosciences, has found that there is an extremely soft layer deep inside the Moon and that heat is effectively generated in the layer by the gravity of the Earth. These results were derived by comparing the deformation of the Moon as precisely measured by Kaguya (SELENE, Selenological and Engineering Explorer) and other probes with theoretically calculated estimates. These findings suggest that the interior of the Moon has not yet cooled and hardened, and also that it is still being warmed by the effect of the Earth on the Moon. This research provides a chance to reconsider how both the Earth and the Moon have been evolving since their births through mutual influence until now. When it comes to clarifying how a celestial body like a planet or a natural satellite is born and grows, it is necessary to know as precisely as possible its internal structure and thermal state. How can we know the internal structure of a celestial body far away from us? We can get clues about its internal structure and state by thoroughly investigating how its shape changes due to external forces. The shape of a celestial body being changes by the gravitational force of another body is called tide. For example, the ocean tide on the Earth is one tidal phenomenon caused by the gravitational force between the Moon and the Sun, and the Earth. Sea water is so deformable that its desplacement can be easily observed. How much a celestial body can be deformed by tidal force, in this way, depends on its internal structure, and especially on the hardness of its interior. Conversely, it means that observing the degree of deformation enables us to learn about the interior, which is normally not directly visible to the naked eye. The Moon is no exception; we can learn about the interior of our natural satellite from its deformation caused by the tidal force of the Earth. The deformation has already been well known through several geodetic observations. However, models of the internal structure of the Moon as derived from past research could not account for the deformation precisely observed by the above lunar exploration programs. What the research team focused on is the structure deep inside the Moon. During the Apollo program, seismic observations were carried out on the Moon. One of the analysis results concerning the internal structure of the Moon based upon the seismic data indicates that the satellite is considered to consist mainly of two parts: the “core”, the inner portion made up of metal, and the “mantle”, the outer portion made up of rock. The research team has found that the observed tidal deformation of the Moon can be well explained if it is assumed that there is an extremely soft layer in the deepest part of the lunar mantle. 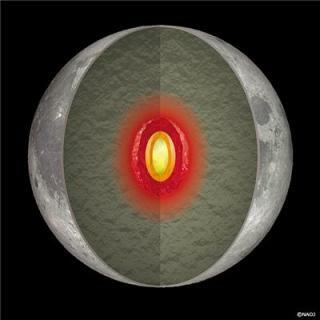 The previous studies indicated that there is the possibility that a part of the rock at the deepest part inside the lunar mantle may be molten. This research result supports the above possibility since partially molten rock becomes softer. This research has proven for the first time that the deepest part of the lunar mantle is soft, based upon the agreement between observation results and the theoretical calculations.